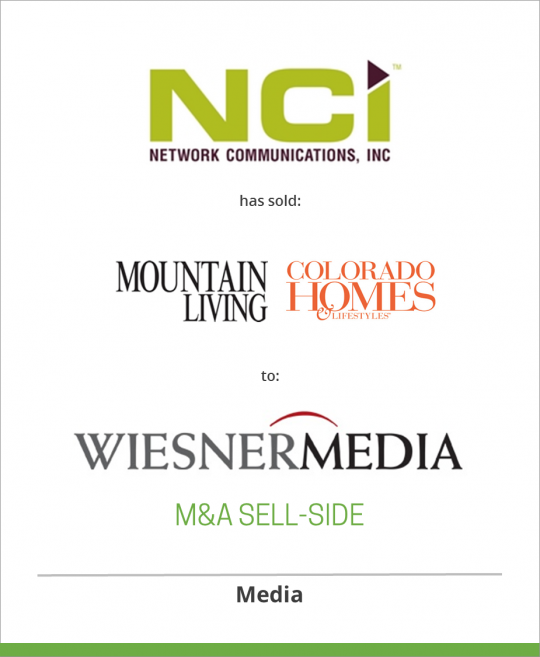 D+P client, Network Communications Inc. announced that it accepted and signed an offer from WiesnerMedia LLC of Greenwood Village, Colo., for its purchase of Colorado Homes and Lifestyles and Mountain Living magazines. Terms of the transaction were not released. WiesnerMedia previously owned both publications and sold them to NCI in May 2005. The buy-back comes at a transitional time for the media and publishing industries. Started in 1980, Colorado Homes and Lifestyles, is a regional publication dedicated to interior design, home remodeling and the quintessential Colorado lifestyle. WiesnerMedia originally purchased Homes from its publisher Garrett Gian in 1989 and started Mountain Living as a spin-off from CHL in 1995. According to WiesnerMedia, both publications will maintain their current teams and eventually merge their offices with those of WiesnerMedia. WiesnerMedia is a full-service, nationally recognized, award-winning company that covers the full spectrum of publishing including: sales, editorial, design, photography, production, printing and circulation. The company owns a portfolio of award-winning magazines and newsletters in a variety of industry verticals, including travel, higher education, the performing arts, business and energy. WiesnerMedia comprises both a consumer division, with its ownership of popular city magazine Pittsburgh Magazine and Trucking Times, as well as a business/trade division, with titles such as a ColoradoBiz, the state’s long-standing business-to-business publication written for professionals. CH&L and Mountain Living will be housed under the consumer titles umbrella. Pittsburgh Magazine has been the leading magazine in Western Pennsylvania since its founding in 1969. Built on a foundation of independent, quality journalism, Pittsburgh Magazine has grown dramatically since its acquisition by WiesnerMedia five years ago. Today the Pittsburgh Magazine brand encompasses a web site serving 6 million-plus annual visitors and an average monthly circulation of more than 50,000.